Academia is a popular career choice for Ph.D. students. While our graduate studies at Johns Hopkins will prepare us to tackle the research side of an academic job, the reality is that professors are expected to teach, yet training to become skilled educators is minimal at best. Recently, a shift in that paradigm could be felt on the Johns Hopkins Homewood campus. 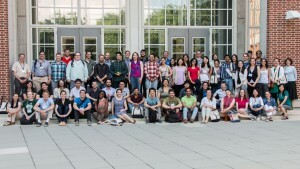 If you walked by the Bloomberg Center for Physics and Astronomy between May 27 and 29, you would have seen a sign out front that read: Summer Teaching Institute (STI). Inside those concrete walls was a group of students/postdocs studying pedagogy, the art of teaching, practicing active learning techniques and having detailed discussions about common issues faculty face in the classroom. STI was developed by Richard Shingles, Ph.D., a lecture faculty member from the Department of Biology, with the goal of providing Johns Hopkins trainees an opportunity to develop necessary skills for a successful career as a university-level educator. Interactive, informational sessions on active learning, assessment, evaluation, issues of diversity, writing a teaching statement and developing a teaching portfolio were led by a combination of 10 Johns Hopkins faculty members. Their audience was a collective of 37 students from the Homewood campus, 37 from the school of medicine, and 10 members of institutions that belong to a consortium known as the Center for Integration of Research, Teaching, and Learning (CIRTL). On the first day, I was assigned to a table with five other students. We worked together on exercises that introduced us to teaching techniques and shared our views on the weaknesses of current educational practices. At the end of three long days, each table was tasked with presenting a 15-minute lesson on any topic that incorporated key concepts we had learned. And the best part is that the experience didn’t cost anything! This opportunity was free and even came with an endless supply of food and coffee. As someone with a personal interest in evolving how we teach science, I found the Summer Teaching Institute to be an excellent way to build my educator toolkit. It was invigorating to be surrounded by so many other students across numerous disciplines who all shared the same passion for teaching. I would highly recommend this workshop to anyone planning to enter the realm of academia. Professional development in education should be of interest to all university-bound scientists. Even if your main interest is research, you will still be charged with the responsibility of passing on your knowledge to the next generation. Let’s make sure we excel at that task! If you missed out on this opportunity, there are plenty of additional resources out there. STI is part of a larger organization called the Preparing Future Faculty Teaching Academy. This certificate-granting program aims to provide Johns Hopkins graduate students and postdocs with training and practice in teaching. Additionally, Johns Hopkins is a member of CIRTL, which provides employees and trainees with free access to numerous online courses and resources on teaching pedagogy. Check it out!